Place the potato, onion and haloumi in a colander placed over a bowl and press out any excess moisture. Place the potato mixture in a large bowl. Add the flour, pepper and half of the oil, and mix well to combine. Heat the remaining oil in 2 x 18cm non-stick frying pans over medium heat. Divide the potato mixture between the pans, press into an even layer and cook for 6 minutes or until golden brown. Carefully turn out, return to the pan and cook for a further 6 minutes or until golden brown. Set aside on plates and keep warm. Add the chorizo to the pan and cook for 2 minutes or until crispy. 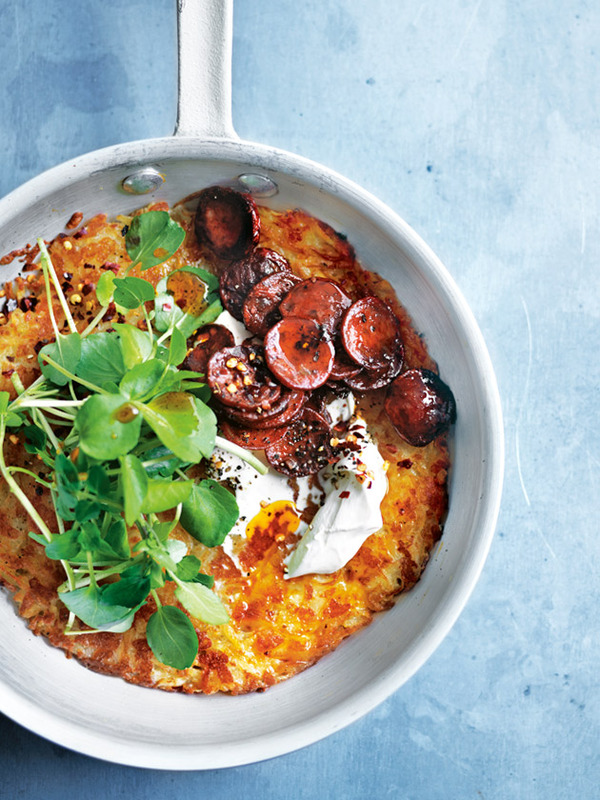 Top the rosti with the sour cream, chorizo, chilli flakes, pepper and watercress to serve. Serves 2.